Well we are in the final stretch… Today we covered a variety of neck gussets and neckbands. Who knew so many creative possibilities?! Next Week – last class in this series – plan on a review of the overall Gansey construction with highlights of specific techniques. Let me know if there is one that you would really like re-demo-ed. Also, bring any design ideas/questions you have. 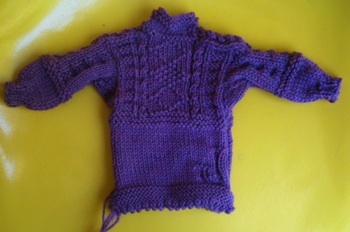 I plan on spending most of the class assisting you folks in your personal gansey sweater design. So if you know the stitch and row gauge with the yarn you like, generate and print out copies (10?) of the graphing paper so we can start to plot out your Gansey pattern design. We will also crunch the numbers and fill in your info into the worksheets.